1. 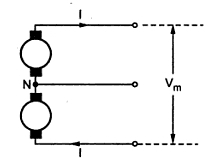 The maximum voltage (Vm), between the conductors is same. 2. The power (P) transmitted in all the systems is same. 3. The distance ( l ) over which the power is transmitted is same. 4. The copper losses (w) are same in all the systems. The system is represented in the Fig. 1. 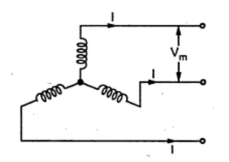 The voltage between the two conductors is Vm. It can be seen that there are no changes in the condition which we have discussed for two wire D.C. system for overhead system earlier in (previous post section 1.1). The system is shown in the Fig. Fig. 2.
it can be noted that the maximum voltage Vm exists between the two lines. 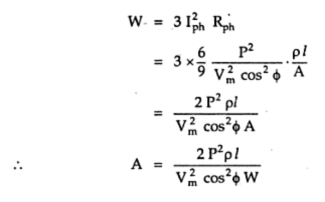 Thus the volume of copper required in this system is same as that required for two wire d.c. system. The system is represented in the Fig. 3. Again the voltage between the two lines is maximum which is Vm. where A = area of cross-section of each line conductor. 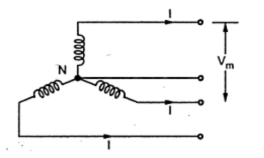 Let area of cross-section of neutral wire is half of the area of cross-section of each conductor i.e. 0.5 A. 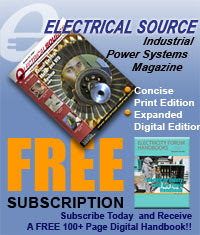 Thus the volume of copper required for this system is 1.25 times that that required for 2 wire d.c. system. So 25% more copper is required in this system. Consider a star connected three phase three wire a.c. system as shown in the Fig. 4. 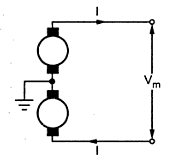 Note that the voltage between the line conductors is Vm. Thus the line voltage is Vm. 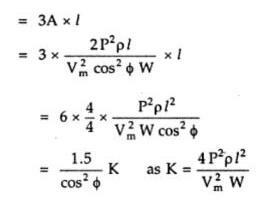 Let cosΦ be the load power factor. 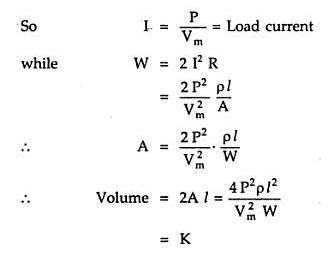 Thus the volume of copper required in this system depends on the load power factor and it is 1.5/cos2Φ times that that required for two wire d.c. system. The resultant remains same whether the system is star or delta connected. The system is shown in the Fig. 5. The neutral is available for the load connection. 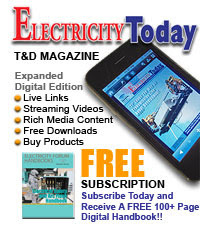 As the load is assumed to be balanced, the neutral current is zero and the copper losses in neutral are zero. Note that the voltage between the lines is Vm. Let the cross-section of the neutral wire be half of the cross-section of each line conductor i.e. 0.5 A. 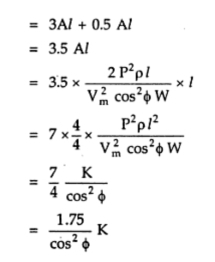 Thus the volume of copper required in this system is 1.75/cos2Φ times the volume of copper required for two wire d.c. system.